The injury that has sabotaged ANNIE POWER’s bid to retain the Champion Hurdle crown is the latest setback to mask the excitement enveloping the countdown to another Cheltenham Festival. The 9yo mare damaged a ligament under her knee this week while preparing for her belated seasonal re-appearance, which would have been her first outing since those spectacular performances at both Cheltenham and Aintree last spring. And she joins the likes of fellow big guns DON COSSACK, SPRINTER SACRE, VAUTOUR, CONEYGREE, VALSEUR LIDO and JOSIE’S ORDERS who will not make the giddy gig in March. As we trudged out of Prestbury Park after the Grand Annual just over 11 months ago, we could not have dreamed, in our worst nightmares, that the winners of all four of the meeting’s premier races, the Gold Cup, Champion Hurdle, Champion Chase and World Hurdle, not to mention the wonderful Ryanair Chase, would not be back in 2017 to defend their titles? Annie Power’s absence will be particularly hard felt by trainer Willie Mullins and owner Rich Ricci, given previous bad luck at the Festival when she was collared close home in the 2014 World Hurdle and then tipped up at the last in the 2015 Mares’ Hurdle. Mullins has always identified her as the closest thing he has seen to the mighty DAWN RUN, and granted a cleaner run through her injury-plagued career, she would surely have gone on to forge a similar reputation, not just over hurdles, but also over fences. Given her rising years, it must now be odds-on that she is retired to the paddocks either before or after Punchestown. With Annie Power out of the Stan James-sponsored Champion Hurdle on March 14, all eyes are now on her superstar stablemate FAUGHEEN who, of course, must shrug off an even longer break if he is to repeat his success of 2015. The 9yo is on course to tackle the Irish Champion Hurdle at Leopardstown on Sunday in a race that will also confirm, or otherwise, the Festival pretensions of PETIT MOUCHOIR. Formerly trained by Mullins but now with Henry De Bromhead, the 6yo grey underlined the rapid improvement he has made since last year’s Festival with a resounding victory last time over NICHOLS CANYON, the only horse ever to lower the colours of Faugheen. Should the Ricci gelding follow Annie Power on to the defectors’ list or prove unable to rediscover his best, Petit Mouchoir is unquestionably the rival best placed to take advantage. Odds of 6/1 non-runner, no bet, for the Cheltenham contest strike me as an attractive proposition to help De Bromhead exorcise his Champion Hurdle demons of 2008 when stable star SIZING EUROPE came there cantering two out to win the race, only to be stopped in his tracks by a back injury that forced jockey Andrew McNamara to virtually pull him up. Having said all of that, if Ricci is to be denied a second shot at Champion glory with both Annie Power and Faugheen, it would not surprise me if VROUM VROUM MAG did not assume the mantle. Most observers believe the brilliant, versatile 8yo is definitely destined for the Mares’ Hurdle, which she won with ridiculous ease last year. But she’s far too good to be wasted at such a level, and both trainer and owner have always insisted she is a worthy supersub should anything untoward happen to their leading lights. Hurdles or fences, and any trip. Minus Annie Power and minus Faugheen at his best, VVM has the ability to win the Champion Hurdle, in my view, and a speculative wager at 16/1 before Leopardstown on Sunday is worth considering. It’s that time of year, isn’t it, when we all start to be tempted by ante-post bets as the major spring festivals loom. I wouldn’t dream of opposing THISTLECRACK in the Timico Gold Cup, but with credible opposition thinning all the time, DON POLI must be of each/way interest at odds of 33/1, which are an insult to his return to form in the Lexus Chase over Christmas and also to his terrific career-record at Cheltenham. For similar reasons, JEZKI, back in the winners’ enclosure last weekend after a long lay-off, is too big at 8/1 for the Sun Bets Stayers’ Hurdle (formerly the World). Looking further down the line to the Randox Health Grand National, and I was taken aback by the muted appreciation of the display by ONE FOR ARTHUR in landing the Betfred Classic at Warwick a couple of weeks ago, not only from race readers but also from bookmakers, some of whom left him as big as 40/1 for the Liverpool race. I suspect it was one of those runs admired more by those of us who were in the stands on course, rather than by those at home watching on TV, because he had an awful lot of ground to make up after being badly hampered early, yet did it with consummate comfort in the style of a class act. Considering he jumps for fun and has also proved he can master the Aintree fences, there’s little not to like about Lucinda Russell and Peter Scudamore’s progressive 8yo. The handicapper put him up 10lb for his Warwick romp, which means, off a new perch of 147, he is sure to make the National field. Incidentally, it was terrific news this week that prize money for the magnificent National meeting, to be sponsored for the first time by Randox Health, is to rocket above the £3 million mark this year. The rise comes hot on the heels of a similar injection into the Cheltenham Festival prize fund which drew criticism from some quarters, most notably trainer Alan King, that beggared belief. 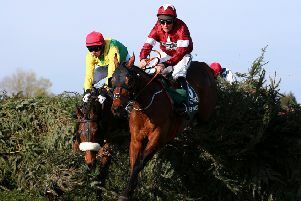 Jumps racing boasts, in Cheltenham and Aintree, two of the sport’s greatest meetings in the world, yet the purses for some of its races are fractions of those on offer for major Flat contests that are no more than handicaps, albeit cracking ones. King’s argument that the grassroots of the Jumps game needs the money more than the flagship festivals does not wash. Yes, all levels of racing require a regular financial stimulus, but this isn’t a trade-off between the best and the worst. It is crucial that racing continues to reward quality at the top end of the sport and takes care not to throw good money at bad by subsidising too heavily a talent-free bottom end. Somehow, but no doubt much to the relief of those of you who don’t take kindly to opinion-overkill, I have managed to plough through this column without mention of Kempton Park and ITV Racing. Suffice to say that I still haven’t decided which side of the fence I will jump with regard to the planned Kempton closure, while the forensic analysis of ITV’s coverage continues to leave me cold. If only such forensics could be applied to the details behind Jockey Club Racecourses’ attempts to sell off the King George VI Chase venue. Surely racing deserves to be given more information, more reliable, robust figures behind the financial ins and outs. As for ITV, I think they’re doing well. Just like Channel 4, their coverage is largely polished and professional. In fact, I think it’s a lot like Channel 4. However, given their total audience-share is double that of the smaller channel, viewing figures so far have been lamentable, particularly for their New Year’s Day debut at Cheltenham, given it was so heavily promoted and marketed beforehand. Lamentable, that is, only if you believe that terrestrial TV coverage, of any sport, amid a digital media and communications revolution that has uprooted our lifestyles and habits, is still as relevant as it was. I don’t.